"Undoubtedly, many Taiwanese would take the MBA Programme in USA or in Europe as their first priority, but I chose a different way to extend my career path. Job opportunities are more accessible in Asia, and in Singapore, the NUS MBA programme holds such a great position with geographic benefits, professional faculty, Asia-focus know-how, international students, aggressive career services, and abundant resources." "Singapore is a pivot bridge between the East and West. Its culture, economic environment and business all provide me with a practical laboratory to experience business in Asia. 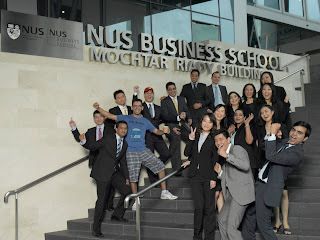 I chose the NUS MBA for its highly reputable programme internationally, prestigious faculty staff, and Asian-oriented curriculum."